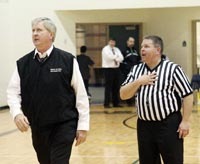 Having registered his opinion to the referee, coach Fred Trenkle heads back to the bench during a Wood River Middle School eighth-grade boys’ basketball game last Feb. 29 in Hailey. Trenkle and game officials have pretty much conducted an ongoing conversation during his 40-year coaching career. By the way, the eighth-graders won the game, 38-31 over West Minico of Paul. Recently retired Blaine County educator and longtime basketball coach Fred Trenkle of Shoshone will be honored Thursday, Dec. 20, during Wood River’s home basketball game with the Buhl Tribe. Trenkle, father of four and grandfather of 11, started his basketball coaching career of more than 40 years in 1970 at the old Wood River Junior High School gym in Hailey. He became a record-setting and Hall of Fame men’s coach at College of Southern Idaho in Twin Falls. In 10 CSI seasons from 1984-93 Trenkle compiled a remarkable 329-36 record including a national championship 25 years ago in 1987. His teams set a national record of 137 home wins from 1984-92. A Blaine County teacher for 22 years, Trenkle ended his career coaching both the Wood River High School girls’ varsity squad and middle school eighth-grade boys last winter. It was a demanding regimen for the 63-year-old coach—40 games of coaching and 172 practices over four months. He would grab a hot dog in Bellevue on the dark drive back to his home in Shoshone. Trenkle had two separate stints as the Wood River High boys’ varsity coach, from 1973 to 1980 with a 100-58 record, and from 2003 to 2006 with a 21-48 record and Wood River’s last state tournament visit, in 2004. Back in 1974, Trenkle led the Wolverine boys to their highest-ever state tourney finish, second place. His biggest fan has always been wife Juanita, who has spent many, many winter hours in the bleachers watching her husband at work. Find more about Trenkle on today’s Express Web site. Wood River High basketball teams made a couple of long trips to Burley for Great Basin Conference games last week. On Friday, the Wolverine boys (3-3, 0-1 league) dropped a 59-22 decision to Burley (3-3, 1-0). Eron Bates scored 10 points, Max Mauldin 7 and Alec Nordsieck 5 for Wood River. Thursday, the Wood River girls (1-9, 0-5) fell 52-11 at Burley. Contributors included Sydney Tidwell (6 points, 5 rebounds, 1 steal), Brittney Bradley (4 points, 1 board), Ciceley Peavey (1 point, 2 assists) and Sammy Sutton (3 boards). Wood River’s girls hosted Filer (9-3) Tuesday and travel to Gooding (4-7) Thursday, Dec. 20.